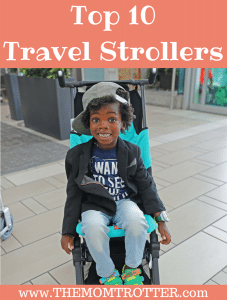 If you travel with young kids or kids who complain about walking, then you should understand the importance of a good, sturdy light weight travel stroller hence my reason for this list of “Top 10 Best Strollers For Travel”. Aiden always had one complain or another when he was younger, so I always traveled with a stroller or a carrier. Traveling with a stroller was nice because he could nap in it if we had a long layover and I could hang my purse or his backpack on the handle bars and be hands free. It was also perfect for when I had to rush through the airport because he would sit in it and we would get to where we were going on time. If you’ve traveled with young children, then you understand! Below is my list of top 10 travel strollers in no particular order. This stroller fits newborns all the way to children weighing 55lbs. It also has a recline which is perfect for naps. It has a canopy for sun protection and a peek-a-boo window. It also comes with 2 cup holders and a zippered storage pocket. It is lightweight and weighs only 14lbs. Super compact, and folds standing. This stroller is great because it is infant car seat ready. There is no need to buy additional adapters to use it. It has a built-in car seat belt which is a great addition. It is narrow and compact and weighs 13lbs. The minimum recommended weight is birth up to 44lbs. It has an easy two-step fold and meets the regulations for airline carry-on luggage. It comes with a travel bag and shoulder strap which is awesome. This stroller weighs 13lbs and folds small enough to fit into an airplane overhead compartment. It has a reclining seat, an extendable leg rest and a soft drive system which enables you to navigate over rough terrain. It also accommodates babies from birth up to 40lbs. The only con with this stroller is the high price tag. 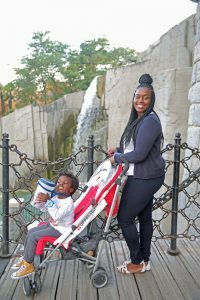 This stroller is the most affordable on this list. It has a 4 position recline which is great for naps. It has anti shock front wheels and lockable rear wheels. It also has an adjustable and removable canopy with flip out sun visor. It has an extra-large storage basket and a rear storage pocket. It weighs 13lbs which is great for travel. This stroller can be used from birth up to 50lbs. The Doona is the world’s first infant car seat with an attached stroller. It allows you to move from car seat to stroller in seconds. This one of the easiest ways to travel with an infant. It eliminates needing a car seat and stroller because it is a 2 in 1. This stroller is recommended from birth up to 35lbs. It weighs 16.5lbs which is lightweight considered it is a stroller and car seat together. This stroller is great because it runs smooth on all types of terrain. It is very easy to fold with one and comes with a storage basket underneath. The seat has multiple recline positions and folds in one step. The stroller has 3 wheels and weighs 17.6lbs. It can be used for newborns up until 50lbs. This stroller is for children 3 months and up to 55lbs. It has a 5 point harness, 3 recline positions, as well as a footrest. It is lightweight and weighs 15lbs. It has an extra wide sun canopy which is perfect for sunny days. It has an easy carry shoulder strap, is easy to fold and stands on its own when folded. This is the lightest, most compact and maneuverable double stroller that allows older children to sit or stand on rear platform or bench and younger children to ride in the front in a car seat or sitting. Traveling with two young children can be daunting, but the joovy caboose ultralight was made for that. Minimum child age is birth with a car seat or 3 months without a car seat and rear is 2.5ys. Maximum child age for the front and rear is 45lbs. It comes with a parent organizer and universal car seat adapter so it is compatible with over 28 different car seats. This is worlds smallest folding stroller. This stroller is so small that it fits in the airplane overhead bin. It has an innovative two-step folding design. It is super lightweight and weighs only 9.5lbs. The pockit can hold children from 6 months up to 55lbs. It also has a convenient basket at the bottom that can hold 11lbs of gear. Don’t forget to grab a gate check bag to protect your stroller from dirt and damage. So, tell me; what’s your favorite travel stroller?